As one might guess from the name and the descriptions, Santa Teresa uses a blending process called the solera method. Hacienda Santa Teresa is the first and one of the few distilleries to make use of this unique method to blend rum today. The solera method was used for blending sherry in the mid 19th century, though it is believed it was developed sometime before then. 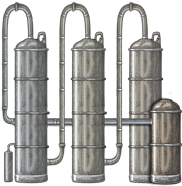 The idea behind the process is for the rum to take different characteristics from older rums. 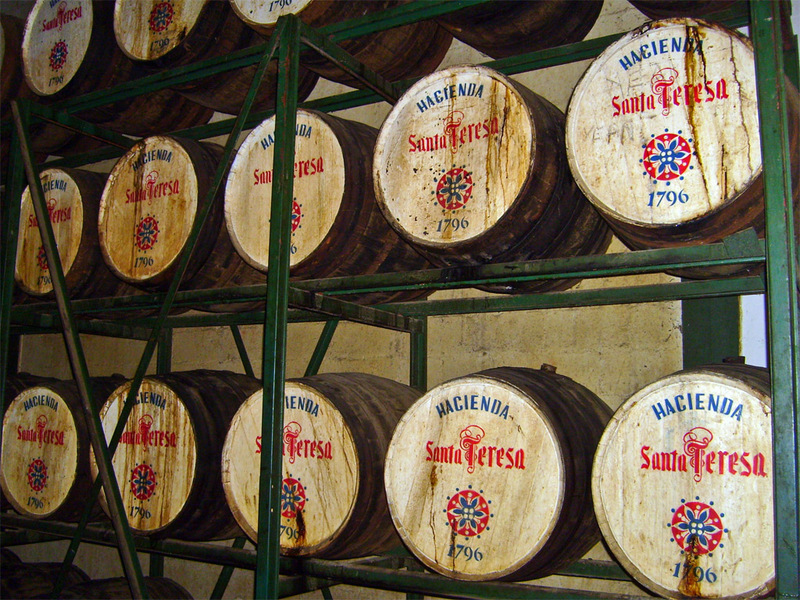 Santa Teresa uses four levels of Limousin oak barrels in their solera process. The top three levels of barrels are called the Criadera and the lowest level is called the Solera, which contains the oldest rum blend. When the rum in the Solera level is ready for bottling about half of the rum is transferred into large American oak vats where it is batched to be bottled as Santa Teresa 1796 Ron Antiguo de Solera. About half of the rum blend from the first Criadera is then transferred into the Solera casks and the first Criadera is refilled with the rum from the second Criadera which in turn is refilled with the rum from the third and the last Criadera where the youngest of the rum blend is. This type of blending ensures that the quality of the rum remains consistent. It is almost a pity to break the beautiful wax seal shielding the cork, but what can you do? Santa Teresa 1796 is brilliant deep amber with very thin and fast legs that, after a swirl, leave behind scattered splashes of alcohol residue. Vanilla, caramel and brown sugar are the first aromas I notice in the myriad of aromas in this complex rum. Moving my nose slowly across and around the glass I can detect a delicate tequila aroma and occasionally the escaping notes of banana. Fruity and sweet flavours start at the tip of the tongue. Santa Teresa 1796 evolves into vanilla and dry wood flavours as it travels across the tongue. Having swallowed the rum and received an encouraging burn in the upper chest, the taste of slightly bitter coffee beans make their presence known. Santa Teresa 1796 finishes into long lasting smokiness and the already familiar vanilla and coffee. 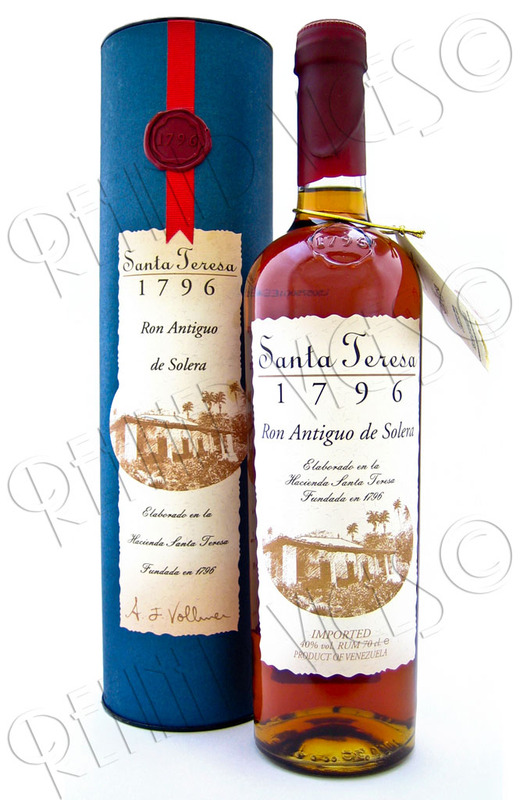 Altogether Santa Teresa 1796 Ron Antiguo de Solera is quite toasty, very round and very consistent to the last drop, which makes it a very good rum. To me it was hard to discover all the flavours and aromas in this rum and for that reason I had to sample Santa Teresa on several evenings to confirm whether my experience was still the same the next evening. All I can say is that I didn’t mind indulging in this fine rum that often at all. Distillery: Ron Santa Teresa C.A. 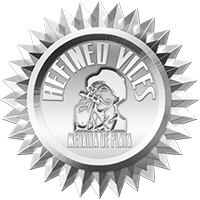 Join the conversation in the forums and find out more information about Santa Teresa 1796 Ron Antiguo de Solera. Download the Santa Teresa presentation and production information by IPBartenders. Santa Teresa Power Point presentation. Santa Teresa rum production information. Special thanks to Edward Hamilton from the Ministry of Rum for providing the picture of the Santa Teresa Solera System.